Eng. Dr. Tikodri Toboa hands over a copy of the Contract to Director Ms Kisinga Construction Company Mr. Shaikuma Robert. Looking on is Prof. Christine Dranzoa (Right), Rev.Fr.Dr.Odubuker and his Deputy Mr. Maxwell Abok and other staff of Muni University. Muni University has launched the second phase of the construction of a 9.4 Billion Health Science Laboratory that is set to complete the first phase of the previously African Development Bank funded project. 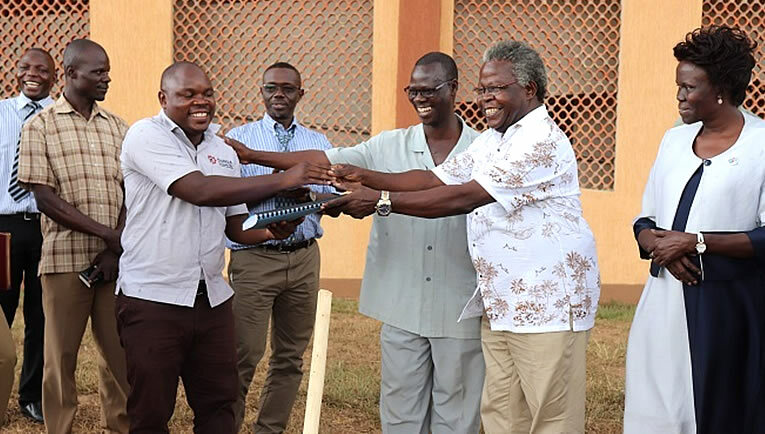 The Project was subsequently launched on Monday 25th March 2019, an event that was graced by the Chairperson Works and Estates Committee of Muni University Council Eng. Dr. Tikodri Toboa, who cautioned the Contractor, a team composed of mainly young people to perform to utmost transparency in the project execution. “I have faith in young people, they are far more active and easy to manage, you can have confidence as long as you do your work well, you will have our backing but under no circumstances should we have a scenario where Lt. Col. Nakalema will come here, I don’t want that” Prof.Togboa said. Lt. Col. Edith Nakalema, is the head of the anti-corruption unit of Statehouse and has in the recent past been well known for her tough stance against corrupt public officials. The Vice Chancellor Muni University, Professor Christine Dranzoa,extended appreciation to the Government of Uganda,Ministry of Finance,Planning and Economic Development, the University Council for identifying a source of funding for the project. She hailed the Government of Uganda funded project as a landmark facility that will go a long way in enhancing the University’s capacity. “We are the first university to start on a green field meaning all that we have been doing is started on a piece of paper and we are coming from far”, Dranzoa said, adding Muni is already at an international level in terms of building partnerships and we want the partners from Harvard, Denmark University, University of Mpumalanga in South Africa, and those from the East African region to be able to come and do quality research, teaching and learning using the facilities”. Rev. Fr. Dr. Epiphany Odubuker, the University Secretary spoke on rather strong terms warning the Contractor Ms Kisinga Construction to strictly abide by the terms of the contract or risk facing tough action. “Muni University takes no less than they deserve, they cherish high quality works that’s why when you move around, the work speaks for itself, so your first challenge is whether you give us equal to that or better; The worst you can do is give us the same quality I don’t talk about giving us less because we don’t want to see that one here” A tough-talking Fr. Odubuker warned. The Director of Ms Kisinga Constriction Company Mr.Shaikuma Robert,who was accompanied by Mr Godfrey Arumadri an Engineer with the Company appreciated the Management of the University for the opportunity to undertake the project and promised to do quality work and deliver within the given time frame. The works are to be undertaken in a period of three years and are to be completed in 2022.